As a collector of antique and vintage jewellery, sometimes selling on eBay, I have accumulated item descriptions, photos, snippets of information and references, and parted with many lovely pieces. It seemed a good idea to start collecting it all together in one place, for my own reference and because other vintage jewellery collectors might find parts of it interesting and perhaps helpful. Of course it also means that I can still enjoy pieces that are now part of other people’s collections! 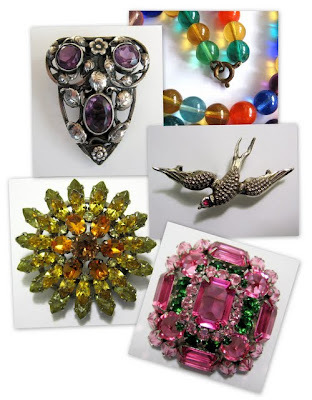 I am not a vintage jewellery expert but like to find out what I can about each piece – part of the pleasure of collecting vintage jewellery, and invariably fascinating. Luckily, there are many excellent reference sites for vintage and antique jewellery collectors – sites by experts which it would be foolish and needless to duplicate. What matters is being able to find them quickly and easily, so whenever possible you will find links to further information and references. While most of the antique and vintage jewellery in these pages – organised into categories on the right – are archives of items sold, some items are currently available at eBay or scheduled for auction soon. The remainder are pieces that (to me at least) have a “certain something” that keeps them in my own collection. Most of all, I hope this site is enjoyable simply for the pleasure of browsing through wonderful examples of vintage jewellery matching your particular area of interest. Here, browse jewellery grouped by type of item: brooches, necklaces, earrings and more. In this section items are grouped by eras and styles, from Victorian jewellery, to 1950s Modernist. This category groups jewellery items by their predominant materials, from stately gold to glitzy rhinestones. Explore antique and vintage jewellery grouped by country of origin, from Mexico to Scandinavia.